Ha’azinu – what might we say and write when we confront our own mortality? Moses knows he is going to die. Not in the way we all ‘know’ we are going to die, the coldly logical knowledge that doesn’t impact on our emotions in any way, but in the way that some people who are very close to death know with a certainty that no longer expresses itself as fear or self-pity but with a clarity and sense of purpose. I have sat at many deathbeds. I have seen denial and also acceptance, whimpering pain and alert peacefulness, sudden startling requests – for toast, for touch, for people long gone, for non-existent sounds or lights to be turned off or up. What I have learned is that we none of us know how we shall die, how our last days and hours will be, but that at many, if not most of the deathbeds I have observed where there is some time for the process to be worked through, there is an opportunity to express what is most important to the dying person, to project themselves one last time into the world. It doesn’t matter at what age we come to death – we want more life, we want to go on in some meaningful way, we want to be part of the future. We all know we will die. We share death with all who have ever lived and all who will ever be. We may fear the how or the when, but generally we get on with life as if death is not real. And we don’t plan for how we might continue to be a part of the future, for how our life may make a difference for our having lived it, or for how or what might be remembered of our existence. Yet sometimes we are forced to confront our own mortality. And when that happens, these questions demand to be asked. The whole period of the Days of Awe which are now coming to a close forces us to acknowledge our own transience in this world. Be it the wearing of the kittel we shall don for the grave, the taking out of a whole day from time to focus on how we are living our lives in order to reset and readjust our behaviours, or the saying of yizkor prayers and visiting the graves of our families. Be it the autumnal edge we feel as we shiver in the sukkah, or the browning and falling of the leaves, or the daylight hours shortening perceptibly – we are viscerally aware of the darkness that is coming, the lessening outer energy alongside the power of the interior life. Sometimes this knowledge that we will inevitably cease to be in this world brings out a search for meaning, for a sense of self that will transcend the physicality of our existence. Sometimes we become engrossed in our own personal wants and needs, sometimes we look further outwards towards our family and our relationships, sometimes we gaze further out towards our community or we look further in time to see what will be after we have gone. I think often of the story of Moses in the yeshiva of Akiva (BT Menachot 29b), comforted by seeing that Rabbi Akiva is citing him as the source of the teaching being given, even though he does not understand anything of the setting that is 1500 years after his own life. It is a story of not being forgotten, of projecting values down the generations. Talmud also tells us that R. Yochanan said that when a teaching is transmitted with the name of its author, then the lips of that sage “move in the grave” (BT Sanhedrin 90b. Rabbinic Judaism gives great honour to the idea that we live on in the teachings we offered, but also in the memories of those who choose to remember us. It is commonplace in the Jewish world to be named for a dead relative in order to honour their memory, to tell stories about them long after the hearers (or even the tellers) have a first-hand memory of the person, to fast on the day of their yahrzeit (anniversary of their death) as well as to light a 24 hour candle and to say the kaddish prayer. So it is time for us to give serious thought about how we project ourselves into the future, what we pass on in terms of life lessons, the stories people will tell about us, how they will remember us, how they will carry on the values that we have cared about enough for them to see and for them to choose too. All rabbis have stories of sitting with the dying as these desires clarify. One colleague has I think the ultimate cautionary tale of being asked to come out to a deathbed of a woman he barely knew, a long way out from where he lived, in terrible weather, and sent in the form of a demand. Deciding that he must go but unsure of what was wanted, he collected together a number of different prayer books to be able to offer her the spiritual succour she wanted. Her final wish was that her daughter in law would not inherit her fur coat. She was taking her feud past the grave. I remember the woman who sat in bed in her hospice writing letters to everyone in her life, beautiful letters – but she refused to actually see any of the people she was writing to. I remember the people who made great efforts to right wrongs and those who tried to comfort the people left behind. I think with love of the woman who sent an audio file with her message that she had had a wonderful life with the right man and they were not to grieve, even though her death seemed unfairly early. I think of the woman who, having lost her fiancé in the war, proudly told me she was going back to her maker virgo intacta, and the woman who told me of her abortion while she was hiding in Nazi Germany, and her belief that the child had visited her alongside its father who died some years later. Many a personal secret has been recounted at a deathbed, but often having been released from the power of that secret if there is time, the soul continues its journey in this world, and suddenly all sorts of things come into perspective. And it is these stories that I remember with such love and that have had such great impact on me. The stories that people had hidden from their nearest and dearest but which explain so much of who they are and why they have done what they did. Their belief that they were not loved enough which led to them thinking they were not able to love as much as they wanted. Their umbilical connection to Judaism that they had not lived out publicly for fear of what might happen to them or their children should anti-Semitism return as virulently as they remembered in their youth. Their subsequent horror that children and grandchildren were not connected to their Jewish roots, and their guilt at having weakened this chain. There are multiple examples but what I see again and again is the need for good relationships with others, for human connection with others , for expressing warmth and love and vulnerability, the need for living according to clear and thoughtful moral values, and for a sense of deep identity that passes from generation to generation and connects us to the other in time. Moses in sidra Haazinu is just like any other human being, wanting his life not to be wasted but to be remembered, wanting his stories and his values to be evoked in order to pass on what is important to the generations that will come after him, however they may use them. He needs to be present in their lives, albeit not in a physical way. The whole of the book of Deuteronomy has been his way of reminding, of chivvying, of recalling and reimagining the history he has shared with the people of Israel. He uses both carrot and stick, he uses prose and poetry, he is both resigned and deeply angry, he is human. There is a biblical tradition of the deathbed blessing, a blessing which describes not only what is but also what is aspirational. Rooted in that has come the idea of the ethical will to pass on ideas, stories and thoughts to the next generation of one’s family, a tradition that has found a home also in reminiscence literature. Sometimes we find out much more about the person who has died from their letters and diaries than they ever expressed in life – and often we mourn that it is now too late to ask the questions that emerge from these, or to apologise or explain ourselves. As the days grow shorter and we have spent time mulling over how we are living our lives and trying to match them to how we want our lives to have looked once we see them from the far end, we could take a leaf out of Moses’ life’s work in Deuteronomy and write our own life story, not just the facts but the stories around them, how we understood them, what we learned. Next year we might write it differently, but what a rich choice lies in front of us, to explore what is really important to us and to ensure that it, like us, will live on. Ki Tavo: Moses’ words echo today – what of us will echo in the future? Ki Tavo includes the famously difficult passage known as the tochecha, the red lines of society’s expectations laid down mainly in the form of the cursing of the one who disobeys, but there is a great deal more in this speech which is part of the series given by an increasingly anxious Moses as he approaches his death. The whole thrust of the book of Deuteronomy is given life by Moses’ desperate wish to help the Israelite people continue on their journey with God after he is no longer around to help them. So here we have the ritual of sacrificing the first harvested fruits of the land to God carefully spelled out – the fruits should be put in a basket, taken to a specific place of worship, given to the priest of the time – and one of the earliest bits of liturgical speech is also given here – the people must say to the priest “I profess this day to the Eternal­­­­­­­­­ your God that I am come unto the land which the Eternal swore to our ancestors to give us”. The priest will take the basket and place it at the altar, and then the speech is to continue: “A wondering Aramean was my father, and he went down into Egypt, and sojourned there, few in number; and he became there a nation, great mighty and populous. And the Egyptians dealt badly with us and afflicted us and laid upon us hard bondages. And we cried to the Eternal the God of our ancestors, and God heard our voice and saw our affliction and our toil and our oppression. And the Eternal God brought us out from Egypt with a mighty hand, and with an outstretched arm, and with great terribleness and with signs and with wonders, and God brought us into this place and has given us the land, a land flowing with milk and honey. And I have brought the first of the fruit of the land which you O God have given me”. The whole script is prescribed – and after it what shall happen – you will then worship God, you will rejoice in all the good that God has given to you, and so on. The text is familiar to even the most distanced of Jews – it is the basis for the text of the Haggadah that we read at Pesach. Word for word Moses’ script is recited when we remember the Exodus from Egypt at the Seder each year. 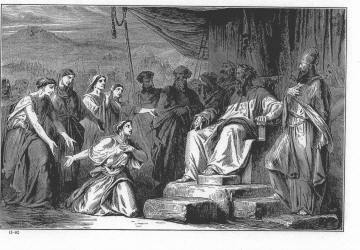 The actual figure of Moses may never have been allowed into the Haggadah in case people should begin to believe that it was his leadership rather than God’s that took us on our journey into peoplehood and covenant, but that becomes irrelevant when we realise that something far more important has been imported untouched by the editorial process of the book – the direct prayer of Moses is embedded in the text as if in amber. The rabbinic statement that a scholar does not ever die fully if his teachings are remembered – phrased evocatively as “his lips move in the grave when his words are recounted” – means that Moses’ teaching really has been passed down the generations and his humanity and presence really do remain among us. As we move towards the Yamim Noraim we are prompted to remember those who taught us our religious and ethical values, and it is a custom in this period to visit the graves of those family members and teachers who have died. We are going to be facing our own ‘day of judgement’ to spend at least one day looking at our lives from the perspective of our own death as we abstain from food and drink and the normal everyday activities we do every other day of the year. We weigh up our actions in the past year and maybe further; consider who we have been, what lessons can be inferred from how we have lived our lives. So the question we have to ask of ourselves now is – how have we done? How are our actions an expression of our values? Will we have been a strong link in a chain or an irrelevant and vestigial structure appended to the community without much adding to it? Every year our liturgical calendar gives us time to consider whether our lives are going in a direction we can be proud of, whether our lived lives are an valuable addition to the world we care about or not. So will the text of our lives be read in the generations to come or as we pass into eternity will we also be forgotten, no stories remembered with warmth and love, no wisdom or behaviour of ours held close to those still in the world? Our legacy does not have to be high profile or high achieving. But how we lived our lives should matter. Inheritance can be one of the most fraught areas of family relationships. Even the best regulated and most even tempered families can discover the pain of frustrated expectation, begin to equate inheritance with love, fall out with each other and end relationships of decades standing once a death has occurred. The daughters of Zelophehad were the first people in the biblical narrative to query the inevitability of inheritance, though not the first to be upset about what they did or did not receive. These five women feel the injustice of their father’s lack of legacy strongly, they want his name to continue into the future, and it matters to them that the physical legacy he left was to be diverted to people who were not his direct descendants, simply because of gender. They band together and approach Moses with their case, and Moses is perplexed – what should he do in the face of this determined group of improbable heirs? As we know, he approached God with his problem and is told that the daughters of Zelophehad speak well, they should indeed inherit their father’s estate, and his name should be allowed to be remembered. So they inherit, but soon, as we learn in Deuteronomy and later in the book of Joshua, limits are afterwards put upon the inheritance of daughters, the old need for land to stay within the tribe takes precedence, and the case law established by these five brave women is constrained, though not repealed. Inheritance is a strange phenomenon. I think of Abraham, the Ur-ancestor, who tells God that there is no point making a covenant with him because he is childless and his estate will all go to a member of his household, Eliezer of Damascus. This text made so much more sense to me once I too became a parent – somehow life focuses more when there is a child to pass on to. And it doesn’t really matter in what area the transmission takes place – tradition, values, wealth, family stories, family name – simply knowing that someone will take it into the next generation makes a difference. Anyone who makes a relationship of trust with another knows that the legacy of that relationship will continue until the end of the life of the partner – and maybe even for longer. What we do, and how we behave with other people, has a lifetime far longer than we expect or think about, the impact of our actions resonates for far longer than we can imagine. Inheritance is a strange phenomenon. It is one of the defining things to give meaning to our lives and at the same time can rupture our connection with the future and the past if not properly organised. It is something we would do well to consider deeply, to make serious plans about, and to consider the impact and the consequences of what it is we bequeath to the world as a result of our life. We are used to the idea of making wills – documents which record what we want to happen to our possessions after our death. Many of us have made a will and have found that contrary to superstition the making of a will has not somehow brought about our untimely demise. But there is more to think about than who gets the jewellery and who gets the house and car. Inheritance is far bigger than possessions – it is, as the daughters of Zelophehad so rightly recognised, what we bequeath about with how we lived our lives and how what we learned or made sense of is transported into the world where we no longer will be. There is in Judaism the tradition of making a regular and updated ethical will. The idea is simple yet so important – besides worrying about who gets what of our material possessions, we spend the time thinking about what values we want to transmit, what lessons we have learned that we want our chosen beneficiaries to understand, what was really of importance in our life that we want not to be lost along with the trivia. It is a valuable exercise, to create an ethical will, in which we put down in black and white what really has mattered to us, be it simple good behaviour or the imperative to tzedakah; be it the need for the discipline of a prayer life, or the permission to doubt God as much as one likes, as long as you still engage in the doubt. There is a powerful tradition of writing the personal ethical will as part of the preparation for the High Holy Days – in other words to begin to do so at this time of year, as we take stock of our lived life and try to make judgements about it, and create a framework for the future in order to live a life more in harmony with what is important to us. It gives us the space to think about ourselves. Not simply as amassers of material goods, nor as people who just get on with life without much thought for any deeper purpose than to live well enough and be successful and good enough – but as human beings who consider that our lives must have meaning and that that meaning is something to be nourished and cherished and transmitted into the future. I heartily recommend that you consider what it is you want your legacy to be. I recommend that you not only make a will, but that you tell your children what that will contains, so that you minimise the broyges after your departure from the scene. I also recommend that you consider what you want your spiritual legacy to be – not something unattainable or perfect and not something that you yourself don’t actually manage to do – but that you distil your values, your belief system, your sense of who you are and why you exist, and write on a plain sheet of A4 some of the truths you have learned which have sustained you on your journey through life, and which you would like to project through your nearest and dearest into the future. Will it be one of infighting for your possessions, of indifference to your existence on this world? Of minor irritations or major frustrations? Will your legacy be framed in such a way that people will recognise your contribution to the world, or will it simply be a dividing up of the goods? I have always been so impressed with Zelophehad and with his daughters. 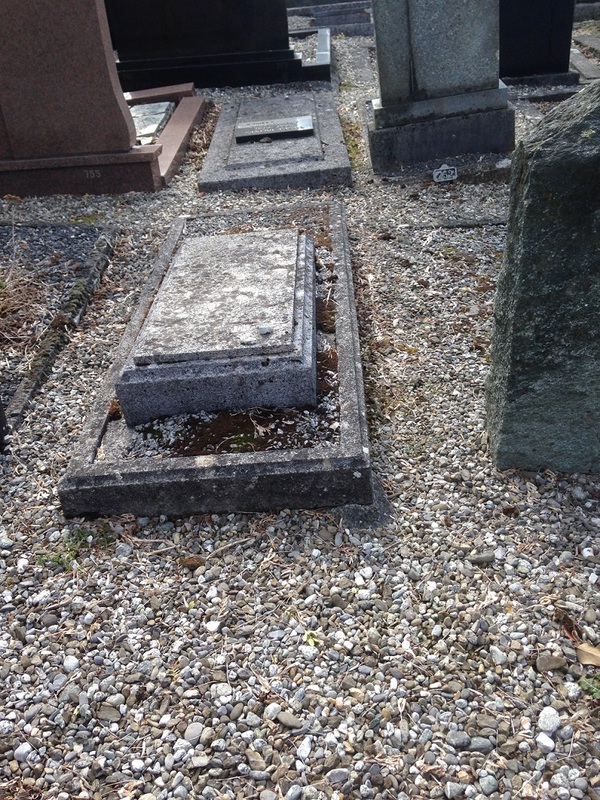 What he owned is irrelevant to me, that his name continued is one of indifference, but the fact that he and his wife bred 5 such superb daughters, who had confidence and tact, who held together to fight for what they felt to be right – that is a legacy to be proud of, an inheritance for which he – and his wife – deserve to be remembered.